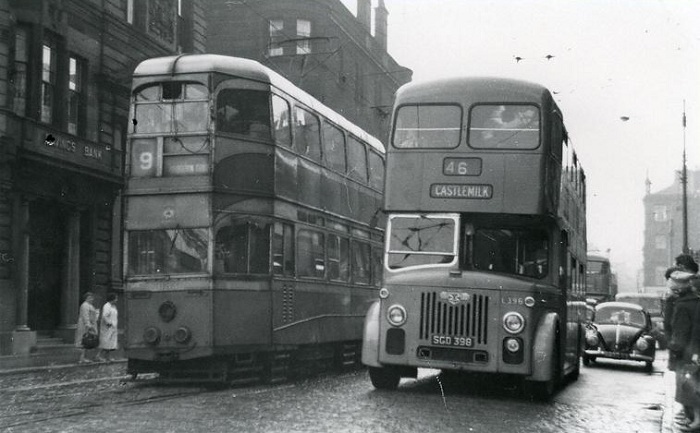 This photo was taken from Glasgow Bus Scene published by X S Publications, Paisley now thought to be no longer trading and by Robert Grieves. Efforts tocontact both were unsuccessful. Copyright © Robert Grieves 1978. Photo credit A. J. Douglas. 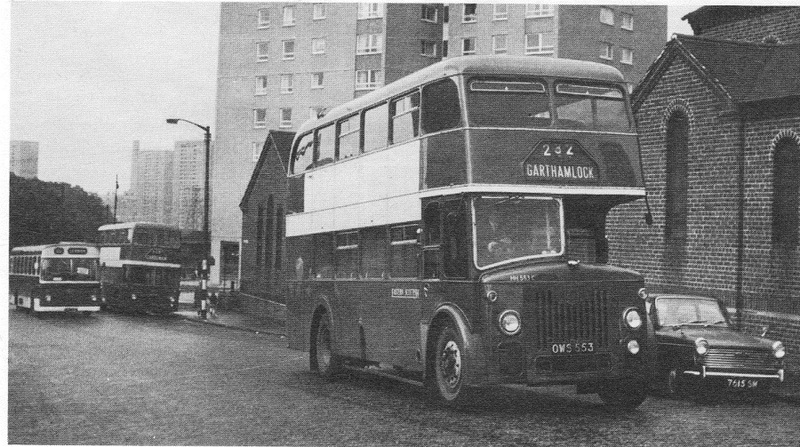 This is a shot taken in Helenvale Street circa 1967 at the bus terminus that served the outlying housing schemes such as Garthamlock, Easterhouse and Barlanark etc. 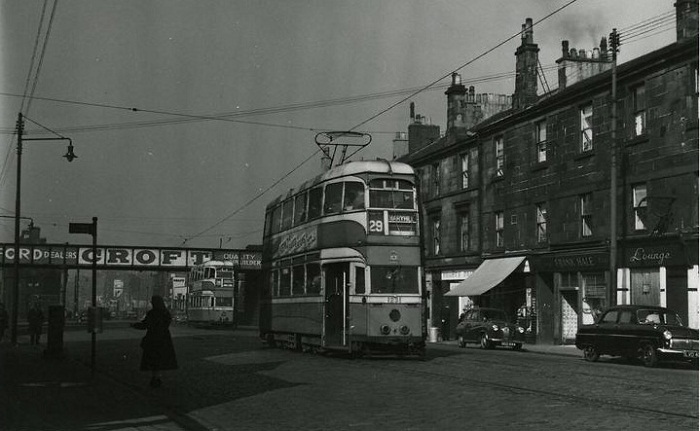 In the background is the high flats and on the right is Calton Parkhead church. 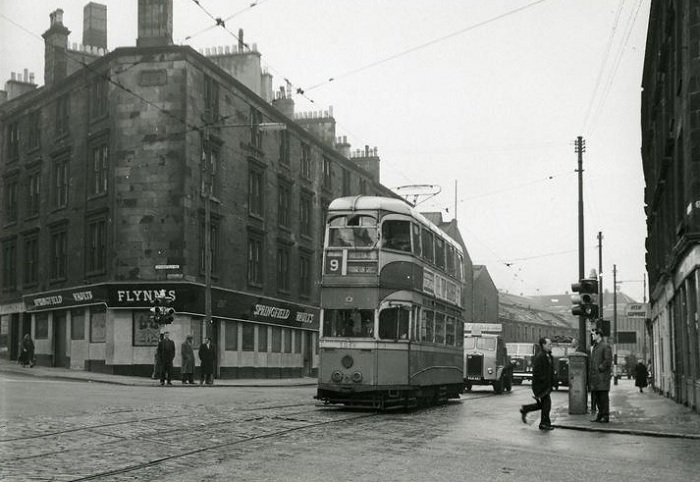 A very early shot showing the junction of Duke Street and Westmuir Street. Behind the bare-footed children stands a water fountain, which is sadly now long gone. Where did the fountain go? Probably a question we will never know the answer to. 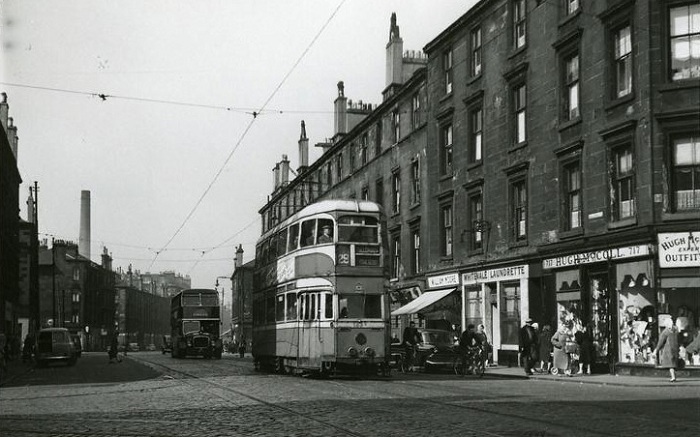 Parkhead Cross at the junction with Westmuir Street and Great Eastern Road. 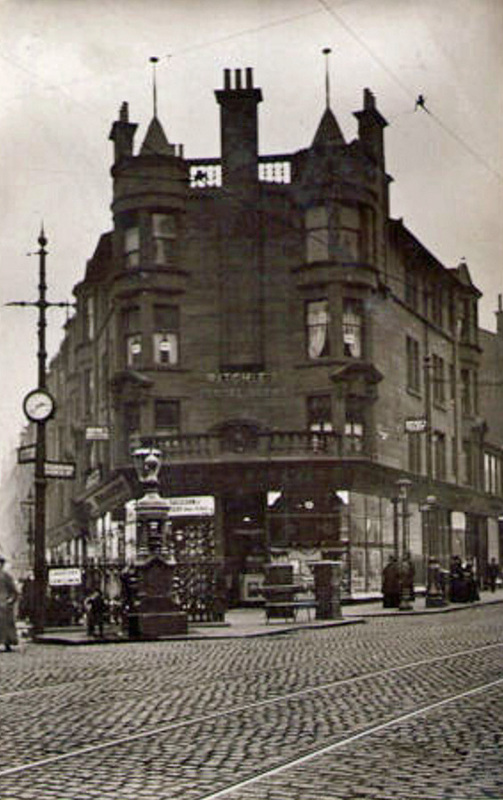 At the Cross was R McFadden, hatter & hosier who also had premises at 96 Canning Stree (London Road)t and 499 Duke Street. Also on the building is an advert for Ritchie” Dental Rooms which was located at 623 Great Eastern Road. 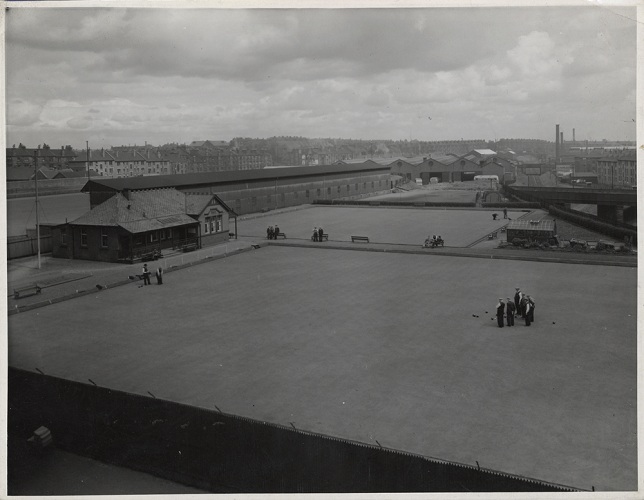 Shinty Ha’ was the name given to a row of red tiled cottages which stood in the Great Eastern Road at Parkhead, just beyond Parkhead Library. 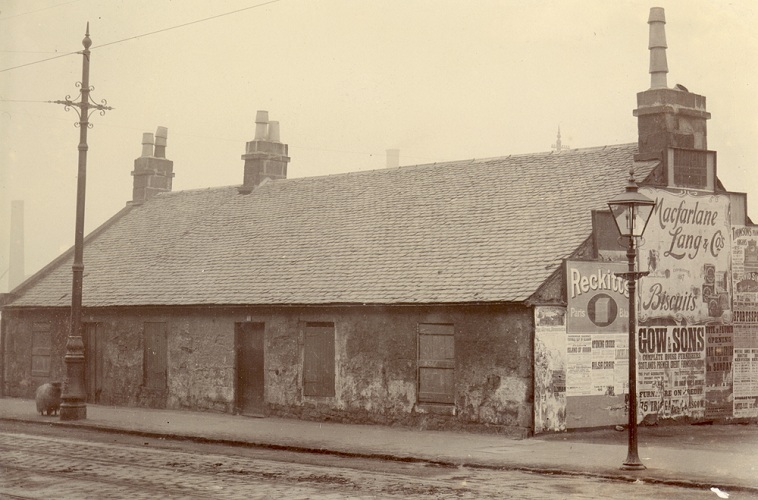 One of these cottages was said to have been the last home in which handloom weaving was carried on in Parkhead, perhaps even the last in Glasgow. A stray sheep, thought to be Dolly’s Great Great Grandmother, has wandered into the left side of the photograph. Copyright © Scottish Motor Museum Trust. Reproduced by kind permission of Scottish Motor Museum Trust. A well known East End watering hole, Flynn’s Springfield Vaults. 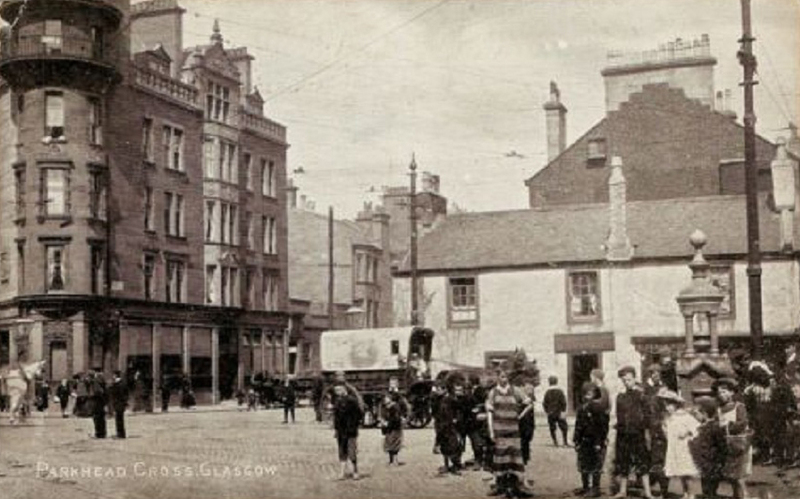 The Gallowgate just about Rochester Street. Shops are Whitevale Laundry and Hugh McColl, Outfitters. Gallowgate at the Croft bridge. Shops are Wright’s Dairy, Frank Hale. Lounge Bar – who can name it? Also in shot is Austin and Ford Consul cars. London Road. 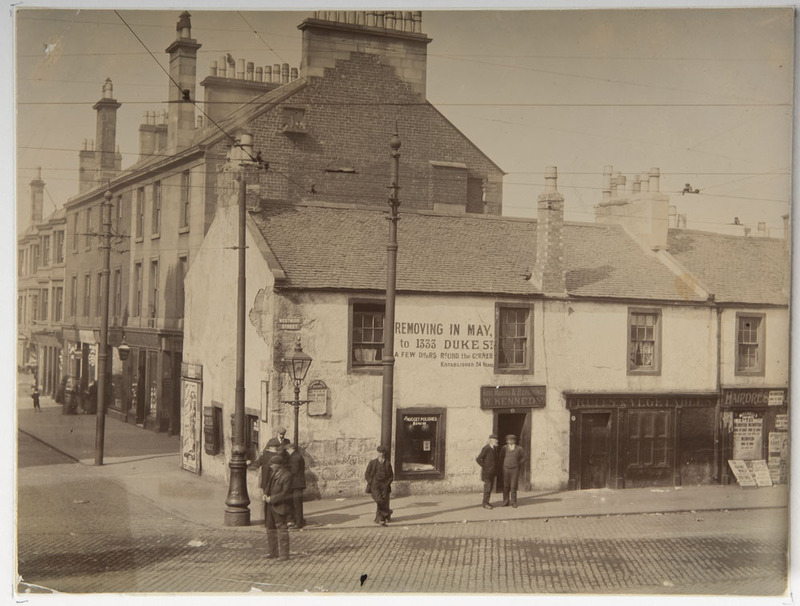 On the left at the corner of Landressy Street is the Savings Bank. 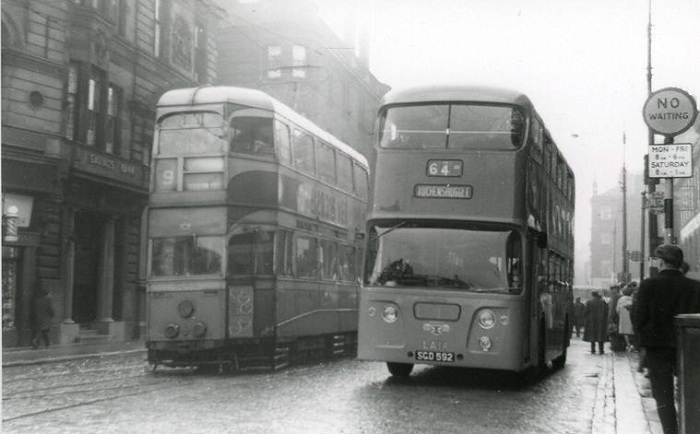 Cunarder Tram and Leyland Titan bus Type 3/2 circa 1960-61. Old fashioned VW Beetle although these have now re-emerged recently. Almost in the same spot at Landressy Street another Cunarder with a Leyland Atlantean bus probably a Mark 1 from circa 1962-63.
fantastic old photos.. well done for finding them love the sheep…. Great site. Love the photie of the sheep outside the Inn. You don’t see that every day especially in Parkhead! It just brings home how rural Parkhead once was.